(Largely compiled by Lindsay Raitt from a number of sources, some of which are mentioned in the text. 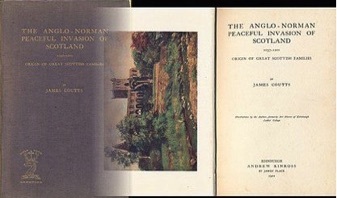 There are three additional publications which provided important background for the author's analysis, Duncan's “Scotland: The Making of the Kingdom”, Ritchie's “The Normans in Scotland” and Morris's “A Great and Terrible King”. Corrections and additions will be made as necessary). The first documented references to someone who we can, with certainty, say was an ancestor of the Rait family can be dated to the last 20 years of the 13th century, and reveal the activities of Sir Gervase de Rathe of the County of Nairn in the north-east of Scotland. I have found only seven items of evidence about him, which for convenience I have called “The Witness, The Paymaster, The Castle, The Homage, The Parliamentarian, The Inheritance, and The Seal”. Taking each in turn I have analysed it against the background of the social, military, political and economic environment of the time, to try to reconstruct as much as possible, from such a limited basis, of the later years of his life. I have then described what this can tell us about the origins of the Rait family, and show why I discount some of the writings of Victorian (and earlier) antiquarians which I believe to have been unjustifiably accepted as accurate renderings of Rait family history. The earliest documentary evidence, in calendar years, is The Witness. It is the oldest existing deed of conveyance of the Kilravock Castle property. It is a long one, but the only part of real interest to us is the list of witnesses to the signing of the deed, which I have taken from the version of the papers held in the charter chest of the family of Rose of Kilravock which was published by The Spalding Club of Aberdeen. By this deed Elizabeth Bisset, the widow of Sir Andrew de Bosco and chatelaine of the castle of Kilravock and its estates, transferred the inheritance of the Kilravock property to her daughter Marie as a dowry on the occasion of her marriage to Hugh Rose who owned the property of Geddes (neighbouring the lands of Rait Castle). The witnesses to the conveyance were recorded thus "Hiis testibus, domino W comite de Ros, domino Roberto Lovel vicecomite de Invernys, domino David de Graham, domino Johanne de Strivelin, domino Reginaldo le Chen, militibus, Gervasio de Rath, et multis alijs." What can we learn from this document? Firstly, the seal has become "detached" from its host. However, as the great majority of the seals in this collection at the Record Office relate to the deeds of homage collated in the "Ragman Rolls", and the one which should have been attached to the homage of Gervase is missing, there can be little doubt that this seal was originally appended to the deed which Gervase signed at Elgin in 1296. Secondly, I believe it may be because Gervase used a cross for his seal that it has been suggested by some sources that he had been a Crusader. I don't know if we can make such a direct connection, but as Gervase held a primarily military office in Moray, and as he probably lived through a time when there was at least one Crusade to the Holy Land, it is not impossible. Firstly, the cross engrailed is very different from the three sheaves of grain used by all the members of the Comyn family, and this reinforces my conviction that Gervase was not a Comyn, for there can be little doubt that he would have emphasized the power of his position as Constable by using the arms of such a very powerful family if he had been entitled to them. Secondly, a survey of the 912 seals held by the Records Office and associated with the Ragman Rolls documents, shows that only 27 carried the symbol of the cross, and 16 of these were the Scottish saltire or St Andrew's cross. The remaining 11 seals were crosses of six different heraldic designs, and only two were "engrailed". One, of course, is that of Gervase, the other is attributed to Sir William de Sancto Claro. The Sancto Claro family, who have been traced back to a small property just north of St Lo in Normandy, became the Sinclairs. Does this mean that Gervase was a cadet of the St Clair family, and that his ancestors were a branch of that family, in their part of Normandy? Perhaps Gervase had children who later inherited the Rait lands and castle? There are still many unanswered questions, but the search for the origins and history of Sir Gervase de Rathe and his family continues. See also under the Raitt Context and blog entries (for instance, Are we Normans and Were our ancestors Crusaders or Conquerors) for further discussion on Gervase and other putative members of the de Rathe family. 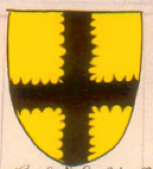 In addition see under Differencing of Arms on the Heraldic Symbolism page at the bottom for the suggestion that perhaps Gervase (and his brother Andrew) were possibly third generation Raitts to bear the their arms by virtue of the engrailed cross. 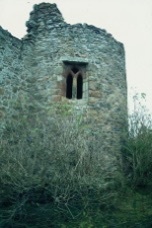 Who built Rait Castle? Simpson's expertise on the subject of the castles of the north-east of Scotland is unarguable, and his opinion, based on the architectural features, that Rait Castle was built at the end of the thirteenth century must be correct. Given the state of serious unrest beginning with Andrew de Moray's insurrection, construction must have been completed by May 1297. As two of the "Braytoft receipts" were signed "given at Rathe", implying that Gervase was in residence then, construction may have already been completed, or at least been well under way by 1291. Gervase was the magnate with both the wealth and the motivation to build this unusual castle, and he undoubtedly had the close contact with Reginald le Chen, through his military role in defence of Moray, to have been responsible for the architectural similarities with Le Chen's Duffus Castle, noted by Simpson. I have not the slightest doubt the Gervase was responsible for building the castle whose remains exist to this day. What was the status of Gervase? Although his first appearance in our records appears to precede his knighthood, it must have followed quickly thereafter, and his position as Constable of Invernairn, with financial responsibility for the stewardship of other royal castles further to the west, and his close association with the Guardian, suggest that Gervase became the "second-in-command" of the military defence of Moray. He was one of the important governors in Moray. What happened to Gervase? I have postulated his possible early death at the start of the 1297 rebellion which culminated in the War of Independence, simply because his brother was granted the rights to his lands at this time. But I cannot be sure, as there is some other tenuous evidence which might indicate that he just possibly survived, but in a totally different capacity. What happened next? We know that one of the many actions King Robert Bruce took after his victory at Bannockburn in 1314, was to recognize, as did his predecessors, that the effective running of the country would depend on a large cohort of experienced administrators. He could only obtain them by reinstating some, at least, of the land-owning aristocracy who had opposed him during the long period of unrest. I suggest that Sir Andrew must have been one of those to whom Bruce restored the rights to their lands, and the occupancy of the castle which became the family seat for a further century. Because we have records of later de Rathes, dating to the second half of the fourteenth century, it seems likely that Andrew had children from whom the subsequent family is descended. Indeed, it has been suggested that at least one de Rathe/Rait remained in the castle for quite some years after Sir Alexander Raite was forced to flee to The Mearns after killing Andrew, Thane of Cawdor around 1405 (see Rait Castle Owners and Occupants). Which brings me to my seventh, and final piece of evidence about Sir Gervase, The Seal. It is a very small thing, but it does have implications which influence my story. A primary source for the evidence I have presented has been Bain's 1884 "Calendar of Documents in the Records Office relating to Scotland". The photograph of the seal of Gervase de Rathe included in his Appendix of "Unattached seals" is very poor, but it is evident that it carries the same heraldic symbol that has been used by generations of Rathe/Rait descendants. The seal of Gervase is a "Cross engrailed" (that is, the edges of the cross have cup-shaped indentations), surrounded by a version of his name. So, what can we deduce from this? Once again, the historical background is important for our understanding of what this item tells us. In his influential book "The Scottish War of Independence", published in 1914, Evan Macleod Barron gives an account of the attempts by Edwards I and II of England to annex Scotland, which ended in the crushing defeat of the English heavy cavalry on the field of Bannockburn in 1314. As Barron graphically explains "in spite of all the ever-present display of English power, in spite of all the memories of Edward's recent visitation, and the fame of the warrior statesman king, to Inverness, (where Le Chen and others were meeting), came throughout the winter and the spring (of 1297) rumours of discontents, of risings here and tumults there, and all the varied murmurings which presaged a coming storm". One of the Scots nobility held hostage by Edward, Andrew de Moray, "son and heir of one of Scotland's greatest houses", escaped from his English prison and returning to his home lands, raised the standard of rebellion. The men from his estates, the citizens of Inverness, and an increasing number of discontented men from the north formed a small, but determined army which in May of 1297 invested the king's castles at Inverness (where Reginald le Chen was besieged) and Urquhart on Loch Ness. They then swept across the Moray plain, and by July held all the lands west of the River Spey. To complete the story, Andrew de Moray went on to link up with the commando forces of William Wallace from the south of Scotland, and together they soundly defeated Edward's army at the battle of Stirling Bridge in September of 1297. During these early summer months of 1297, letters describing the situation, and pleas for military assistance were sent to Edward in England by Sir Reginald le Chen and his colleagues charged with maintaining the King's peace in the north, namely his brother Henry le Chen who was the Bishop of Aberdeen, the Earl of Mar, John Comyn who was the Earl of Buchan and Constable of Scotland, and his brother Alexander Comyn. The courier who conveyed these messages to Edward in England was Sir Andrew de Rathe, and he was charged with explaining to the English King how dire the situation had become for the King's allies. He must have spent much time in the saddle that year as he also returned with Edward's unhelpful responses. But that is why he, Andrew, was with the King in Kent on 11 June. Firstly, it is probable that the first major target for destruction by Andrew de Moray's army in its progress across the coastal plain in May would have been the King's Castle of Invernairn, and surely it is reasonable to assume in the light of the transfer of Gervase's lands to Andrew, that Gervase had been killed in its defence, if not earlier in opposition to de Moray's advance. There would just about have been time for this to happen, and for Andrew to have conveyed the news to England, and for Edward to secure the loyalty of Sir Andrew by granting him the rights to his brother's properties. Secondly, if we assume the death of Gervase at this time, can we also assume that the inheritance of his lands by his brother probably means that Gervase was childless, and that all subsequent members of the family were the descendants of Sir Andrew? 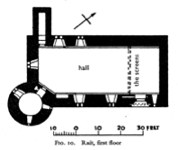 Thirdly, it is possible that Rait Castle survived the onslaught because it was not a militarily significant target. It may well have been damaged, but not seriously as it provided Sir Andrew and his descendants with a home in later years (when the family were not sufficiently wealthy to undertake reconstruction on a major scale of such a large edifice). Secondly, the histories of Nairnshire, and Simpson's study of Rait Castle say that he was a member of the Comyn family. I believe that the original source of this idea comes from the papers of Clan Mackintosh, the family which occupied the largely hill-lands to the south of Moray. In 1265 the clan chief, Shaw Mackintosh, is said to have obtained from the king a grant of the lands of Geddes and Rait. His son succeeded him in the title to the lands, but he died in 1274, and the Mackintosh history claims that during the minority of his son the Comyns "took possession", and, dropping the surname Comyn, took the territorial title "De Rathe". I find the last part of this story very hard to accept, and I have not found a shred of evidence for it. The truth is that the lands of Rait were part of the king's demesne, and at his disposal to grant them to whoever he wished. Undoubtedly at this time he gave large allocations of Mackintosh lands in Badenoch and Moray to the Comyn family which had become so very powerful in Scotland, and it is probable that the Macintosh's in their wrath were only too happy to tar all the perceived interlopers with the same Comyn brush, ignoring subtle distinctions of family origin. I have found no evidence at all of any association between the de Rathes and the Comyns. Surely the Comyn family was so powerful in the affairs of Scotland in the late thirteenth century that a man in Gervase's situation, particularly in his military role as Constable of the King's castle in Invernairn, would have wished to emphasize his own position and authority by continuing to use that family name if it was his to use, as all the rest of the extended Comyn family seem to have done. I see this story as Mackintosh "spin" to justify the (unsuccessful) claims which they made in the fifteenth century to lands which they had owned in earlier years, but lost in rebellions against the Crown. I don't believe that the Macintoshes can be relied on as a source. Surely Gervase's membership of that group of Norman-origin aristocracy settled in Moray, and his, and his brother's, close involvement with the Guardian of Moray, le Chen, together with their involvement with, and apparent loyalty to the English king, are convincing evidence of his belonging to that group of in-comers to the area. His roots must lie in the “Norman invasion" of Scotland. I have not yet been able to explore the records from the South of Scotland or England for occurrences of names likely to be de Rathe ancestors, but would not be surprised to find some traces. The Ragman Rolls record that in Elgin on the same day fealty was sworn by the Earl of Mentieth, Sir Thomas and Sir Nicholas de Soulis, Sir John Wychard, Sir Alexander of Argyll, and Sir Alexander Comyn. Ten days earlier, Sir Reginald le Chen met the King in Aberdeen, at the border of his area of responsibility, and pledged his loyalty there. On 28 August 1296, Gervase is amongst the very large number of Scots who again pledged their loyalty to Edward at the parliament in Berwick (along with his brother Andrew de Rat and also one Roger de Rathe). The sixth piece of evidence, which I have called The Inheritance, is dated 11 June 1297, and is a letter patent signed by Edward I at his palace in Kent, "committing to his liege Andrew de Rate all the lands of Gervase de Rate his brother in Scotland". This deed is the only source of our information that Andrew was the brother, and successor of Gervase. The fourth and fifth submissions, The Homage and The Parliamentarian, both come from a single source, called the "Ragman Rolls", and to understand these we need to return to the history of these politically turbulent decades. I described earlier how Edward I chose John Balliol to be the King of Scotland, his coronation being in 1292. Initially Balliol acted as the subservient puppet Edward expected, but as time passed Edward's demands, particularly for money to support his activities in his French provinces, and in prosecuting his Crusade to the Holy Land, became unsustainable. The Scottish lords deprived Balliol of his executive authority, and a number of them sought and received promises of aid from the French king in their defiance of Edward. Infuriated particularly by the French alliance, Edward invaded Scotland in March 1296, defeated a Scots army at Dunbar, and made a triumphal progress through eastern Scotland to Brechin in Angus where he humiliated Balliol and brought his reign to an end. During this progress, which then continued as far north as Elgin in July of 1296, he demanded, and received oaths of homage from all the Scottish landowners and other dignitaries. He then returned south to Berwick where he convened a Scottish Parliament intended to give legality to his demands for the future governance of Scotland, and there required the assembled Scots to re-affirm their allegiance oaths and renounce the alliance with France. On his return to England, Edward laid on William de Tang, clerk of the diocese of York, the task of compiling lists of all the Scots homage deeds or instruments. These lists were written on 35 pieces of vellum stitched together in four rolls, "The Ragman Rolls", which have been preserved to this day. The contents were edited, indexed, and published by Victorian historians, and therefore the names of nearly 2000 Scots nobles, knights, churchmen and burgesses, a group of most, but by no means all, of the chief men of Scotland, are easily accessible to us today. On 27 July 1296, at Elgin, Sir Gervase swore allegiance to Edward. The document which he signed still exists "much defaced and with its seal lost." 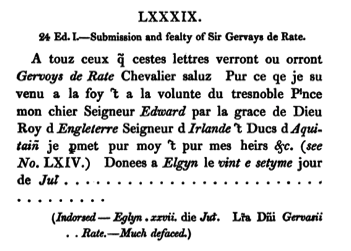 The letter, written in Norman-French, tendering his loyalty and obedience on the occasion is published in Palgrave's Documents and Records Illustrating the History of Scotland. with a dais at one end for the lord of the manor and his family. or his brother Sir Andrew de Rait. probably one who had learnt his trade in the ecclesiastical buildings in France. To these comments I would like to add one observation of my own, namely, that while the castle has some remnants of defences for its own local security, it is located in an absolutely hopeless tactical and strategic position, overlooked by the rocky hill-side to the south with no adjacent natural features such as the rivers and gorges which defend other major castles in the area, and it lies well to the south of the main routes of traffic across the Moray plain. I can see no good military reason for placing the castle where it is. To my mind, Rait Castle has all the appearance of the luxury country residence of a wealthy land-owner, built at a time of relative peace, with no particular role to play in the military posture of the region. Who could that land-owner be but the Constable of Invernairn, Gervase de Rathe, with the primary seat of his military power located in the king's castle to the north, and, by virtue of his function as chief tax-gatherer of the fruitful agricultural lands of the plain, able to cream off at least his tithe, and probably a great deal more of the wealth of the area? Additionally he would have been well-placed to employ in the construction of his "second home" the master-mason of Duffus Castle, the seat of Reginald le Chen, his immediate military superior. Given the historic events surrounding that window of relative peace and prosperity in the decade from about 1285 to 1295, I have no doubt that Gervase was responsible for the construction of the Rait Castle we see today, and that it reflects his position in the social history of the late thirteenth century. Also given that two of the Braytoft receipts dated 1291 were issued "at Rathe", rather than at Nairn, I conclude that the hall-house was already built and in use by Gervase at the start of that last decade of the thirteenth century (the arguments regarding the origins and spelling of the names Rathe and Rait are lengthy and convoluted, and not critical for this history). In the 12th century, the period of post-Macbeth rebellions in Moray and constant raiding from the Celtic Highland west and the Viking north, the authority of the King was exercised and his power demonstrated by the construction of a series of Royal castles, massive structures built in stone, and controlled by his appointees, the Constables. In the late 13th century, the senior government representative and military officer in the province of Moray, the Guardian, was Sir Reginald le Chen, witness to the Kilravock conveyance, who was based at Duffus Castle, north of Elgin. His authority would have been exercised through, and with the assistance of, the Constables of the Royal castles in the north. The daily running of the Castles was the responsibility of the stewards or castle governors, such as Thomas de Braytoft, which is why Gervase was his paymaster. The Constable was not only responsible for ensuring the maintenance of the King's peace in his area of command, but also for the proper and peaceful collection of the taxes due to the Crown. For much of the country between Elgin and Inverness, Sir Gervase de Rathe was a man of great importance, and power. It is possible, though we have no evidence, that Gervase was already the Constable of Invernairn in the mid 1280's when he signed the Kilravock deed, and therefore that his appointment was made or approved by King Alexander III. If not, then he must have been appointed during the politically troubled period that followed. When Alexander died in 1286, his only lineal descendant was his grand-daughter, whose mother, Alexander's late daughter, had married the King of Norway. Her return from Norway to Scotland came to a tragic end in a storm off the Orkney Islands, leaving no obvious heir to the throne. There were a number of claimants but the only two who mattered were John Balliol, who was supported by the powerful Comyn family into which he had married, and Robert Bruce, Earl of Huntingdon and Earl of Galloway, who died before the resolution of the claims, leaving his grandson, also Robert with the titles and the claim. Bruce was supported by many of the Scottish families who hated the Comyns for their pervasive strangle-hold on the governance of the country. The dispute could not be happily resolved between such determined groups, and because there was a measure of allegiance owed to the English King, for example by Bruce for his very wealthy Huntingdon estates, the claimants agreed that Edward I should arbitrate between the hostile factions. Eventually, Edward chose the malleable, weak John Balliol and he was crowned king in 1292, but in effect, it was the very ambitious Edward who pulled the strings of his puppet. In the interregnum between 1286 and 1292, Edward I gradually tightened his grip on Scottish affairs, and in June 1291 he demanded, and was granted, command over the royal castles in Scotland. Gervase was already Constable by this date, and it seems likely that he was installed by Reginald le Chen, the Guardian of the Province of Moray. Le Chen was initially at least a nominal supporter of Balliol, and continued to be the Moray Guardian both throughout the period of Balliol's reign and the interregnum when Edward I actually ruled the country until Robert Bruce took the crown in 1306. As second in command to Reginald le Chen, a man whose Anglo-Norman roots and tendency to allegiance to the English Crown are evident from the historical record, it seems probable that Gervase was also, at this time, Edward's man. My second piece of evidence, The Paymaster, is a group of three receipts for money paid by Gervase de Rathe to Thomas de Braytoft. These receipts, which survived in the collection of papers removed from Scotland by Edward I and held in the Tower of London (and later in the Records Office at Kew), tell us that by 1291, Gervase had been knighted and had been appointed Constable of the Castle of Invernairn. 11 Sept-20 Oct 1291-2. Receipt by Thomas de Braytoft clerk, keeper of the castles of Nairn and Cromarty, on Tuesday next after the Nativity of the Virgin 1291, at Rathe, to Sir Gervase de Rathe, for 20 marks sterling, for keeping these castles for 40 days since 4th August. Not having his own, he appends the seal of Sir William de Braytoft keeper of the castles of Inverness and Dingwall. Receipt by same person Saturday next after the day of St Lucia virgin 1291, to Sir Gervase de Rathe knight, constable of Nairn, for 31l. sterling, of the farms and arrears of his bailliary, as his wages for keeping these castles. Appends his own seal and that of Adam of the Bridge, burgess of Nairn, at Nairn. Receipt by same, Monday [19th May] next before Pentecost 1292; to same person at Nairn, of 11s. to make up his pay. Appends his Seal. Receipt by same, Monday [18th Aug.] next after the Assumption of the Virgin, A;D. 1292, to the Chamberlain of Scotland and his associate, for 121. 11s. in payment of his wages up till Trinity last. Berwick. Firstly, the deed is not dated, but history helps us to narrow down the likely time-period. More than 200 years earlier, Macbeth was the last of the Celtic kings of Scotland elected to rule under the tanistry system of tribal governance. He was succeeded in the late 11th century by Malcolm III, who was responsible for establishing primogeniture inheritance of the crown, and then in the mid-12th century by his youngest son David I. Both were educated in exile in the court of the English king, and there learned, and became accustomed to, the Norman-introduced centralized methods of feudal governance, which they then gradually introduced into Scotland in their own reign. David I is credited, particularly, with bringing in organized local government and tax-gathering through the system of baronies and thanedoms, and also with completing the replacement, started by his mother, Queen Margaret, of the Celtic church of St Columba by the parishes and priests of the Catholic Church. To achieve their aims, these two kings needed a corps of educated administrators experienced in the methods of feudalism which they obtained by importing some of their aristocratic friends from England. As reward for their services, the two kings, whenever possible, allocated to their helpers the rights to properties forfeited to the crown by defeated rebellious chiefs. The event that is pertinent to the Kilravock conveyance occurred in 1130 when the people of the Province of Moray, under their Celtic Earl, a descendant of Macbeth, rebelled against King David I. The rebellion was put down, and, as the King was by then running short of lands to award to his followers, he allocated the forfeited properties of Moray to his friends, while retaining some as part of the royal demesne. We know that 100 years later, in 1238, the baronies of Rait, and Geddes adjacent to it, were still held as part of the Royal demesne, and similarly, tenure of Kilravock was owed to the King. Elizabeth Bisset was required to seek the approval of the King to a transfer of the rights to the property, and this approval, like all similar arrangements, had, on the death of the monarch, to be re-confirmed by his successor. We know from a second Kilravock deed that Elizabeth Bisset sought re-confirmation of the conveyance from King John Balliol, and so the deed from which I quote is most likely to have been granted by his predecessor, King Alexander III. He died in 1286, so we can conclude that Gervase was already well-established amongst the aristocratic land-owning society of the 1280s in the province of Moray. Secondly, Gervase is present as a member of a group who are evidently of Norman origin. As I have already said, in the time of Malcolm III, and proliferating with his son David I in the mid-twelfth century, Normans or men of Norman origin brought in from England, provided Scotland with a well-educated and administratively-competent elite, who, for the efficient execution of their rule, were accompanied by clerics (or clerks) educated in the abbeys of France and England. It is believed that the families of Bisset, Bosco, Rose, Graham, Stirling, and Lovell, all with property-based surnames, can be traced to origins in Normandy, as, surely must be Le Chen, and therefore can we not assume that De Rathe, as a member of their group and having a property-based surname as they have, was also of Norman origin? These are not necessarily men born in Normandy - at this stage we may be dealing with second, third, or more, -generation Anglo- or Scoto-Normans, but surely we are dealing with people who took their "surname" from the locations of their lands in Normandy, who were members of the aristocratic land-owning families who ruled the country, who probably spoke a form of French, not understandable by the local Celtic-speaking populace, and who were literate in Latin as well as Anglo-French. It is convenient to call them “Normans” to reflect their origin, and to distinguish them from the clan chiefs who continued to rule parts of Scotland under the ancient Celtic tribal system. My third observation about this deed is that the names of Graham, Stirling and le Chen precede the word militibus, whereas Gervase does not. The word “militibus” can be interpreted as "knight" - which we know those three were - and so we can conclude that Gervase was not at this time. But equally, he was not one of the "many others".